By Sue Chan - New Zealand - 18 Jun/03 - Viewed 1796 times. A Midday Concert was advertised at Te Whakarewarewa, which was where we were headed. (As it was Sunday we found these were to be held each hour but at least we were there in plenty of time) This is called the Maori Arts & Crafts Institute, which confused us a bit. 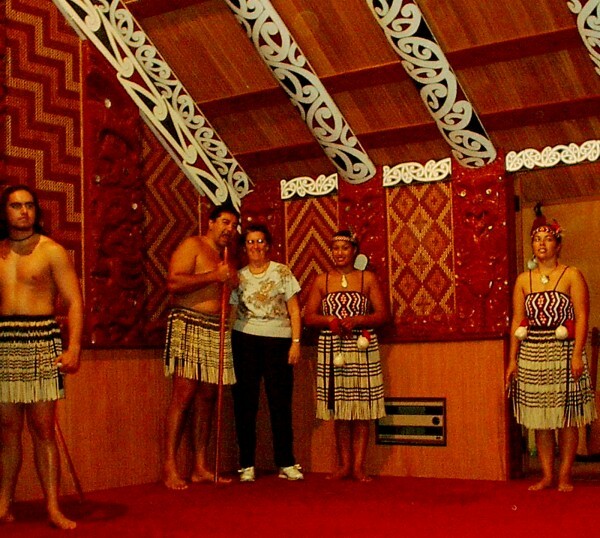 It is well run by Maori people and Maori Trainee Carvers can take a three-year course to teach them the traditional methods and designs and so keep their heritage alive. After lunch at the Pohutu Caf� we went to the midday concert, which we thoroughly enjoyed, then joined a free tour with a guide who tried to teach us how to pronounce Maori names! He explaining many of the carvings, showed us how a traditional meal is cooked in the ground and gave us a weaving demonstration. After this we boarded a little train, which took us around the reserve ending at the nocturnal house where we caught a glimpse of a Kiwi Bird. �Whaka� is an extensive thermal area with silica terraces, mud pools and the famous geyser Pohutu, which erupts about every hour with displays lasting at least 10 minutes. We spent around 2 hours at �Whaka� before booking into Regal Geyserland Hotel where our room overlooked the mud pools and Pohutu, which we thought was great. With directions from the helpful girls at the desk we left to tour the area the first stop being the Blue and Green Lakes. These lakes, separated by only a narrow isthmus, are very different in colour. A little further along the road is Te Wairoa. In 1886 this was a staging point for visitors crossing Lake Tarawera to get to the famous Pink and White Terraces, which were rated as the eighth wonder of the world. The eruption of Mt. Tarawera in June 1886 destroyed these silica formations, buried three villages and killed 153 people. A number of buildings have been excavated and many historic items are on display. There is also a realistic audio-visual of the eruption. A track leads along the trout stream, which flows from the Green Lake to Te Wairoa Falls. Today at Lake Tarawera a launch cruise takes visitors across the lake and waits for them while they complete a walk. Sadly there are now no Pink and White Terraces. With plenty of daylight left we returned to Rotorua to look around the town. We were amazed at the extent of the Government Gardens with lovely flowers and very well maintained sporting areas including several bowling greens and croquet courts. In these gardens is the original Tudor-style bathhouse built in 1906-7 as part of a government plan to develop Rotorua as a spa. We went into the foyer with its marble statues and ornate decorations but as it was now almost 6pm and closing time had to be content with that. The spa operated until the1920s and has recently been restored and now houses the Rotorua Museum. In the same Gardens, also recently restored, is the Blue Baths building, which was opened in 1933. It closed in 1981 after operating for 48 years. The Spanish Mission style baths have been meticulously restored and reopened as a heritage attraction where visitors can swim in the thermally heated pools or visit the Tearoom. Next to this Rachel Hot Spring has a wall around it, which we thought very unusual, and nearby are the Bowling Club premises. It was still plenty of light to see the view from our room while we watched the Rotorua Visitors Information Channel on T.V. Through the evening the rain began again and next morning it was quite heavy making it a bit tricky to get our things into the car. We decided on McDonalds for breakfast instead of a ride on the Gondola in the rain and left at 9am for Wai-O-Tapu where the Lady Knox Geyser erupts daily at 10.15am. An attendant temporarily blocks the vent and adds soap powder, which decreases the surface viscosity of the water and causes an almost immediate eruption. We bought our entrance tickets to the �Thermal Wonderland� then drove back to the Geyser � the tickets covered both attractions. It was still raining and we needed the umbrellas again, if not for the rain then the spray from the Geyser! The walk around the thermal area past craters and sulphur pools was amazing although extremely smelly � much worse than anything we experienced in Rotorua. Following the guide map it did not take much imagination to see why the names had been given to the various sites. There is no picture of the Champagne Pool as its temperature is 74oC and the steam and gasses made it extremely difficult to see, especially with glasses, much less take photos. The water from here flows over the Primrose Terrace where the minerals are deposited as the water evaporates. This has slowly formed the terraces over an estimated 900 years. The terrace ends at the Bridle Veil Falls, which have been partially coloured by the overflow from the Opal Pool. At Wairakei geothermal steam is used to make electricity and huge stainless steel pipes can be seen from the road and from a nearby lookout. This we thought the most impressive man made wonder seen on the trip. The Waikato River System flows from Lake Taupo and supplies eight hydro-electric stations. It also provides the cooling water for two geothermal and one thermal station. These eleven stations produce 65% of the North Island�s power. The Huka Falls, 4km north of Lake Taupo, are one of New Zealand�s most spectacular with an 11metre drop. The average flow is 160 cubic metres per second depending on the release of water at the Lake Taupo control gates. The water has a unique blue colour due to the very clear water reflecting blue light and the air bubbles in the water, which intensify the colour. At Taupo we had lunch and a look around the town while Ron�s photos from his digital camera were being transferred to a disk. Eventually he found he did not need to reuse that card but it was good to know he would be able to take plenty of photos. By now the rain had cleared completely and that was the last we saw on our trip. We were fortunate that it had not interfered much with our plans. Lake Taupo is the largest lake in New Zealand, over 40km long and 30km wide and after a short drive around part of it we left at 2.40pm for Napier.